An open newspaper splayed at his feet, his brow furrowed, Mike Kelleher sat on the steps of Quincy Market yesterday -- not far from where John F. Kerry would soon make his concession speech -- and glumly digested the fact that, once again, the nation had spurned a presidential candidate from Massachusetts. ''It seems like it's sort of a culture war. It seems like the rest of the country is pretty angry at us for some reason," Kelleher, 54, of Brockton, said with a sigh. ''I just don't get it . . . It makes me feel sort of alienated." For Chris Houghton of South Boston, though, a jaunty fatalism had already asserted itself. ''After the Red Sox victory, things are back to normal here," Houghton, 32, said with a shrug. ''From euphoria back to the norm of defeat." Whether they eventually responded with angst or wounded pride or jut-jawed defiance, Massachusetts residents awoke yesterday to fresh evidence of the apparent gulf between this state and much of the country. For many, it was hard not to take it personally. Residents of other states may try to enlist as citizens of Red Sox Nation and heap praise on our clam chowder, but when it comes to one of the Bay State's other chief exports -- presidential candidates --the country has said repeatedly: ''No, thanks." ''I just have hope that someday they'll smarten up and realize we have the right idea," said Carol Kershaw, 46, of Brockton. ''It's not that we just want our homeboys; it's that we're the epitome of the working middle class." Parts of the rest of the nation apparently beg to differ. A stereotype of ''Taxachusetts" as home to Brie-eating, Chablis-sipping, Volvo-driving liberal elitists has gained traction nationwide. While Boston-area residents may consider that stereotype inaccurate and unfair, it proved useful to Bush, who used the word ''Massachusetts" as a virtual epithet during the campaign, even though he attended prep school (Phillips Academy in Andover) and graduate school (Harvard Business School) here. Last month, Bush told a crowd in Michigan that Kerry's proposal for $2.2 trillion in new spending is ''a lot even for somebody from Massachusetts," and said Kerry's proposal to increase taxes on the rich was ''the kind of promise a politician from Massachusetts usually keeps." In July, Bush said in his weekly radio address that the decision to legalize gay marriage by ''the Massachusetts court" sends a ''message to the next generation that marriage has no enduring meaning, and that ages of moral teaching and human experience have nothing to teach us about this institution." Katie D'Urso, 37, of Medford said many of her gay and lesbian friends are ''extremely angry at Bush. ''He's waged a cultural war," D'Urso said. ''It's symbolic: Massachusetts versus the country. I'm very proud to be from Massachusetts, but there's a lot of work to do in the country . . . There's a knot in my stomach. What's going to happen the next four years?" Whatever the cause, the cold reality is that Massachusetts is now 0 for 4 in the past quarter-century when it comes to presidential politics. Senator Edward M. Kennedy failed in his bid for the Democratic nomination in 1980; former Senator Paul E.Tsongas in 1992. Governor Michael S. Dukakis did become the Democratic standard-bearer in 1988, only to be soundly defeated by George H. W. Bush. Small wonder such nostalgia lingers hereabouts for the presidency of John F. Kennedy, the last Massachusetts man to occupy the White House. ''I am a bit surprised, to be honest," said Anne Marie Felago, 23, who lives in the North End. ''I thought that people would be looking for change, and I think that people looked at [Kerry] as more strong than past Massachusetts Democrats." 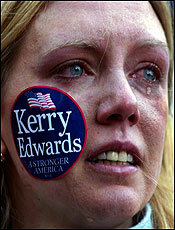 Of course, Kerry's loss did not grieve everyone in Massachusetts. Rose Durivage, 47, of Pittsfield said she had voted for Bush without hesitation because ''he showed himself as a leader when the country needed a leader. He stood up against terrorism when we went into Afghanistan, and he stood up when we went into Iraq." There is something of a tradition of the Bay State being out of step with the rest of the country. After Massachusetts emerged as the only state won by Democratic nominee George S. McGovern against the soon-to-be-Watergated Richard Nixon in 1972, a popular bumper sticker soon materialized: ''Don't blame me -- I'm from Massachusetts." As they voiced concern yesterday about jobs, health care, and the war in Iraq, that nagging question -- What is it about Massachusetts that the rest of the country doesn't like, anyway? -- would not go away. To Kelleher, part of the problem is that the state, in its caricatured form, has become a handy political weapon. ''I think [Bush] is trying to vilify Massachusetts," he said. ''I don't think he has anything against the people of Massachusetts; I just think it's a political ploy." To 26-year-old Mika Hall of Dorchester, the election results stemmed in part from the fact that the ''values and the lifestyles are different, the jobs are different" in other parts of the country. Hall said she had supported Kerry because of his economic, health care, and civil-rights policies, not because he is from Massachusetts. ''I am pretty disappointed," Hall said. ''I was looking forward to change." Some Kerry supporters were fairly bursting with anger yesterday. Jessica Johnson, 59, of Cambridge, who said she had volunteered for Kerry, said she was filled with optimism on Election Day, telling herself: ''When Kerry gets into the White House, this stone, this weight on my chest, will be lifted." ''He could have made a great president," Johnson said. ''Many Americans have nothing between their ears. Americans are fat, lazy, and stupid. I don't like this country anymore." Notwithstanding the state's history on the presidential stage, some Bay Staters seemed surprised by Kerry's defeat. ''He's local. It's too bad," said David Griffith, manager of Destination Boston, a Hub-themed T-shirt and sweatshirt emporium at Quincy Market. Displaying a shirt featuring photos of President Bush and his father with the words ''Dumb & Dumber," Griffith remarked in some bafflement: ''We sold hundreds of these, and yet he still pulled it off." Some voiced worry yesterday that with a Bay Stater having tried and failed to unseat the incumbent, the state may lose whatever political clout it had. Many expressed doubt that a national political party will look to nominate a Massachusetts politician any time soon. ''Honestly, I don't think they would try again," said Mike Ferris, 64, a former Lawrence resident who now lives in Seabrook, N.H. ''I don't think they would throw somebody in from up here. Try someplace else." However, some said that while Massachusetts Democrats aren't likely to get the presidential nod for a while, they aren't counting out Republican Governor Mitt Romney. ''Romney, he could be the next rising star," said Chris Puricelli, 54, of Quincy. ''It might be different for the Republicans." In the meantime, Kershaw has some sage words for any Bay Staters who are mired in despair about the chance of ever sending a native to the White House. ''We waited 86 years for the Red Sox" to win the World Series, she said. ''Patience and endurance: We'll be OK."
Globe correspondent Heather Allen contributed to this report.Don Aucoin can be reached at aucoin@globe.com. JOAN VENNOCHI: Was gay marriage Kerry's undoing?